The OM-EL-USB-LITE is a low-cost temperature data logger that measures and stores up to 4080 temperature readings over a -10 to 50°C (14 to 122°F) measurement range. It has a fixed 30-minute sample rate and a battery life of 1 month with continuous use. Press the button and a red/green LED indicates whether a preset alarm level has been breached. The data logger is configured and the stored data is downloaded by plugging the module into a PC's USB port and running the control software under Windows 98/2000/XP. The downloaded data can be graphed, printed, and exported to other applications. A battery comes installed. To start logging, pull out the tab. The user should replace the battery every month, or before logging critical data. 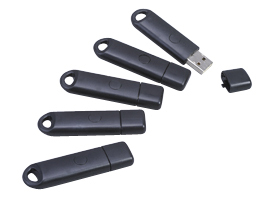 The OM-EL-USB-LITE does not lose its stored readings when the battery is discharged or replaced; however, the data logging process will stop and cannot restart until the battery has been replaced and the logged data has been downloaded to a PC. For maximum logging life, use only OM-EL-BATT-LITE replacement batteries. Before replacing the battery, remove the OM-EL-USB-LITE from the PC. Note: Leaving the OM-EL-USBLITE plugged into the USB port for longer than required will shorten battery life. The OM-EL-USB-LITE has a bicolor LED status light. To save power, it operates for only a short time after the pushbutton is released. Nota: Data logger comes with Windows software on CD-ROM, operator’s manual and lithium battery. Data logger plugs directly into computer’s USB port (no USB cable required).